Gutters are an essential part of the home roofing system. They route rainwater and runoff from melting snow away from the home, help keep basements and crawl spaces dry, and protect windows and siding. Aluminum gutters are currently one the most popular types, but vinyl gutters are becoming increasingly popular because of their lower cost. Many homeowners who are interested in saving money are turning to vinyl gutters because they are the least expensive, light-weight and sold in easy-to-handle sections. The This Old House website estimates that, in 2010, vinyl gutters cost $3 to $5 for a 10-foot length, but that the actual cost is $3 to $5 per linear foot when you add in couplings, fittings and downspouts The price of aluminum gutters is dependent on the thickness of the material and if a polyester, acrylic or baked enamel coating is applied. This Old House estimates the cost in 2010 to be $5 to $9 per linear foot when professionally installed. Some contractors in northern climates, such as Metro Siding, Inc. in Minnesota, will not install vinyl gutters because they don't believe they hold up well in cold weather. Vinyl expands in heat and contracts in cold and has a tendency to become brittle and crack. A plus for vinyl is that it does not rust, rot or decay Aluminum gutters are used in all climates. They, too, do not rust, rot or decay, but they are easily dented and dinged. Most carry a warranty against peeling or chipping. At times, gutters fill with rain, snow or ice, causing them to sag from the weight. If the gutters have seams, the seams will pull apart somewhat. Seams are the most common places that gutters leak, causing damage to siding and windows and allowing water to reach basements and crawl spaces. Seamless gutters are designed to prevent this problem. Vinyl gutters are not available in seamless systems. They come in 10-foot lengths. Aluminum gutters can be purchased in sections or seamless. Seamless gutters are created onsite by use of a portable machine that produces the gutters in the length necessary for installation. Gutter sizes come in 4-, 5- and 6-inch diameters. The choice depends on how much rain or snow falls in your area. 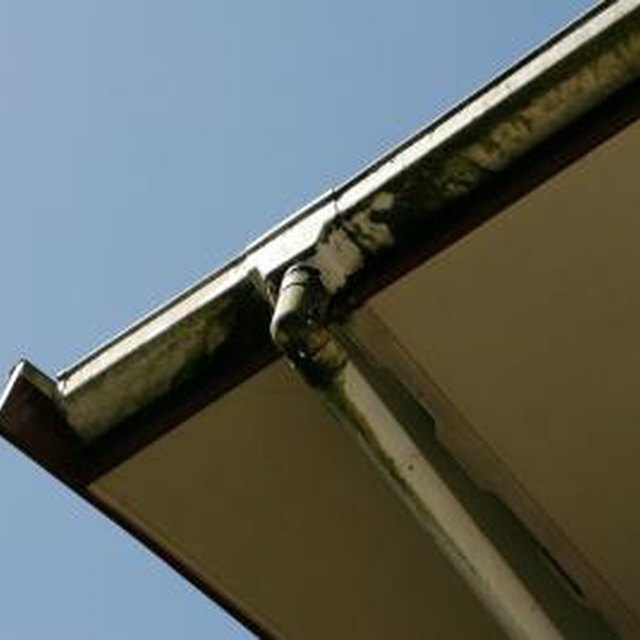 Gutters are commonly shaped to look like the letter K or the letter U. This Old House states that the most commonly purchased gutter is the 5-inch K-shaped. Both vinyl and aluminum gutters come in these shapes. Aluminum gutters generally match or complement the color of the house. About 25 colors are available to choose from. Also, if the home is repainted to a different color, an aluminum gutter can be painted to match Vinyl gutters are much more limited. They are easy to find in brown and white. While other color choices do exist, they require special orders and extra cost. Darker shades of vinyl will fade over time, and lighter vinyl will take on a yellowish cast.